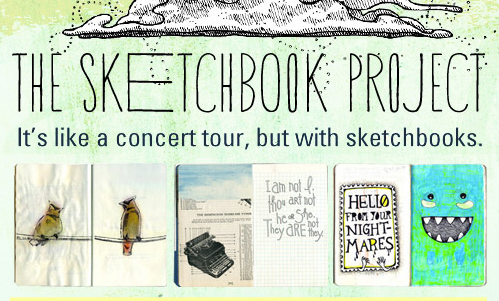 UPDATE: 11/5/10 Sketchbook Project Deadline has been extended! You have until Nov 15, 2010 to order your blank sketchbook. At least a dozen Kutztown students and two professors are participating in the sketchbook project. The organizers, Brooklyn’s Art House Co-op also have two more participatory art projects in the works. One is a photo project called a Million Little Pictures. For ‘MLP’ you pay to receive a throw-away camera from Art House, choose a theme, and share your interpretation with the world. Shoot 27 frames on a single theme and then send in the results. They collect your contributions for a traveling coast to coast exhibition, much like the sketchbook tour. Another project is the “Pockets” project. If you have never heard of The International Association for Empty Pockets, you are not alone. Check the site for details. Two KU illustration students have already contacted us to tell us they are participating in The Sketchbook Project. It should be noted that the Brooklyn Art Library is not part of either the Brooklyn Public Library or the Brooklyn Museum. The name does perhaps suggest that it might be associated with one of these two highly esteemed institutions. The fact is, two young 2006 Atlanta College of Art grads founded the Art House Co-op and Gallery in Atlanta, Georgia. They have since moved to Brooklyn and the new name reflects that move. That said, check it out, it looks like a good opportunity to add a few lines to your resume, and if it helps you fill a sketchbook, that alone is of value. Each sketchbook gets a unique barcode and will be cataloged at the Brooklyn Library of Art. For an added cost of $20, they will upload a digital version of your sketchbook to their web library. Beyond Brooklyn, the upcoming Sketchbook Tour includes stops in Seattle, San Francisco, Atlanta. It will be in Texas at The Austin Museum of Art in March during the SXSW festival. Art Beat at the PBS Newhour website wrote a brief essay about a previous sketchbook tour. If anyone has been involved with past tours, please let us know about your experience. Marissa, Thanks much for the feedback, and best of luck carving out art time!